Dobson said he wants to see the U.S. Fish and Wildlife Service create a system that helps ranchers with all the costs they suffer and have endured for years. He said things are getting better, but it’s taken far too long. SPRINGERVILLE — An Apache County rancher has lost three calves and, as a result, two wolves have been removed from a wolf pack. The cascade of events following the confirmed depredations by the Diamond Pack, consisting of Mexican gray wolves, in Apache County in the days following the annual wolf population census, has begun. Mexican gray wolves, an endangered species that was reintroduced into the Apache-Sitgreaves National Forest in the late 1990s, have continued to expand its population and range in eastern Arizona and western New Mexico’s Gila National Forest. Mexican wolf managers representing several federal and state agencies were conducting an official count of the animals across the region in the past few weeks when a suspected wolf kill was reported in Apache County, one day after a wolf known as AM (alpha male) 1249, of the Diamond Pack, was captured, fitted with a GPS collar and released back into the wild. A suspected attack and/or kill on livestock by wolves triggers investigations, reports, and possibly compensation for the livestock producer if a wolf kill is confirmed. A confirmed kill also triggers specific management actions on the part of the Mexican Wolf Interagency Field Team to immediately stop the depredation. Paul Greer is the Mexican wolf interagency field team leader for Arizona Game and Fish Department. Greer said when his office receives a report of a suspected wolf kill, they immediately contact depredation investigators with the U.S. Department of Agriculture’s Ecological Services Division. He said he encourages the livestock producer to cover the carcass to help preserve the evidence. In these situations, time is of the essence, he said. “The thing I can’t do is do the investigation,” Greer said. Greer said that USDA investigators responded to the scene of the recent killing of three calves and that they confirmed the cause of death was via wolf attack. Greer said his team waits for that confirmation before taking management actions with the wolves. Sometimes, he noted, the kills are attributed to coyotes. “We want to know if it’s confirmed (to be a kill) by a wolf. That’s important to us,” he said. The Independent attempted to contact David Bergman, USDA Wildlife Services state director for Arizona, to learn more about the investigation process, but he did not return our calls. Rancher Carey Dobson’s Vernon-area Timberline Ranch suffered the recent depredations by the Diamond Pack, but he said he does not blame the wolves, adding that the direct loss of livestock is only one part of the problem with ranching in a wolf reintroduction area. Like other ranchers, he’s deeply frustrated. In the pastures where the wolves have been causing problems, some of Dobson’s cows are now calving. He said he could not immediately remove the cattle from the area because he needed to get hay, and the snow and mud made getting a semi-trailer into the location impossible. “It’s not easy, it’s a mucky, muddy mess. It’s dry enough to get a semi in there now,” he added. Dobson said he normally gathers cattle off the pastures in May, brands them, and castrates and vaccinates the calves. But he’s having to pull together that same operation in a big hurry and find feed for the animals because of the wolves. Dobson said he has seen 18 confirmed kills in the last year, and that the wolves can come any time of year. He said he’s lost many cattle since 2000 and that it isn’t easy to keep track of the losses as he runs cattle from Vernon to Big Lake on 200,000 acres of combined leases of state and federal lands, as well as private land. Dobson and a couple of ranch hands went looking for the wolves and the evidence after the kill. Arizona Game and Fish Department is assisting Dobson by covering half the cost to haul the cattle away from the state lands where they are grazing near the wolf pack, and half the cost to return them to the same pasture later this year. Funds for the hauling operation will come from the agency’s general fund, not from funds generated by hunters and anglers. One-fourth of the cost will be covered by a non-governmental organization, and Dobson will have to cover the rest. Wolf depredations on livestock have occurred every year since 1999 — one year after the re-introduction of Mexican wolves into the wild. The Mexican Wolf Annual Progress Report, put out by the U.S. Fish and Wildlife Service, documents that in 1999, with an estimated minimum population of 15 wolves, five confirmed depredations occurred. The numbers of livestock depredations listed in the reports don’t rise gradually every year, although the number of wolves do. The figures seem to teeter-totter in no predictable manner. In 2003, with at least 55 wolves roaming the region, there were four confirmed depredations. But in 2005, there were 22 depredations with a population of 35-49 wolves. Livestock depredations have remained in the double digits every year since 2005 — except for 2010, when there were eight. The last year for which data is available, 2015, saw the highest depredation counts yet recorded, with 49 confirmed wolf kills. Likely, some wolf kills are never found or reported, and many ranchers would probably dispute the official numbers as being far too low. 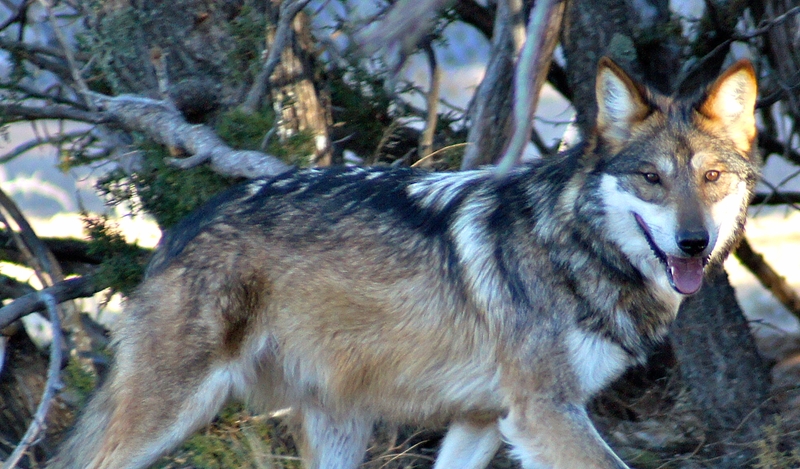 When a livestock producer loses an animal in a confirmed wolf kill, they can apply for compensation funds from three different sources: the USDA Farm Services Administration, the Mexican Wolf Livestock Council (formerly known as the Co-existence Council) and the AZGFD’s recently-formed Livestock Loss Board. The USDA compensates producers under the 2014 Farm Bill Livestock Indemnity program. To apply for the compensation, producers must provide documentation — usually from a recognized authority such as the USDA’s own investigators — that the animal died as the result of a wolf attack. Then they must provide documentation of their herd inventory and “… documents of deaths due to normal mortality,” according to the instructions for the application found online. If the producer can come up with this data, the amount paid to them involves a somewhat complicated formula that accounts for normal herd mortality rates and subtracts a “sequestration” percentage. The application also establishes a fair market value for cows, bulls and younger cattle by weight classes, and for horses. For 2016, the fair market value of a cow was $1,936. Producers could receive as much as $1,529 for the animal from USDA, and could apply to the other sources to make up the difference in fair market value. Applicants must certify that they have not applied to other sources for compensation for the same animal in a calendar year — no double-dipping. Although compensation funding is available, many ranchers don’t apply for it, said Wink Crigler, owner of the X Diamond Ranch outside of Greer. Crigler is on the inside of wolf politics; she sits on the AZGFD’s Livestock Loss Board. Crigler is also frustrated with the slow pace of action at the Livestock Loss Board, which has not yet formulated policies for depredation payouts. “We’re not in a position. We’ve not established a bank account and policies are not in place,” she said. Livestock losses create problems for wolf managers, as well as ranchers. When a wolf kill is confirmed, finding a way to control the behavior of wild predators is challenging, but the IFT does take specific actions in short order. “What we try to do is … assign the depredation to a specific pack, and individual animal, if possible,” Greer said. Then the IFT formulates a management plan to stop the depredations. This includes intensive monitoring and may also include hazing, the tactical placement of diversionary food caches of roadkill game, and the non-lethal removal of specific individual animals. A total of 80 wolves have been removed from the wild across the reintroduction area due to depredation activities between 1999 and 2015, according the Mexican Wolf Annual Progress Reports. Greer said that these management activities also involve keeping affected ranchers in the loop. “We contact area ranchers and the land agency (such as the Forest Service or Arizona State Lands) and notify them of our management actions,” he explained. With the Diamond Pack, two wolves — AM1249 and his sub-adult offspring, MP (male pup) 1558, were removed from the pack on Jan. 30. Since then, Greer said all of the non-collared members of the pack have been captured, collared and released. The IFT is now closely monitoring the pack’s movements through their VHF radio and GPS collars, on-the-ground field observations and telemetry flights. “If the wolves are near cattle, we undertake hazing on the ground,” Greer added. Hazing can involve the use of simple human presence, explosive sounds or honking horns. Greer said that in this particular case, the AZGFD has also provided Dobson with a telemetry receiver so he can personally monitor wolf activity. He has also received a special permit to haze the wolves with non-lethal ammo using a 12-gauge shotgun, if necessary. No further depredations have occurred, and Greer takes this as a positive sign that his team’s efforts are working. He said the intensive monitoring will continue as long as the pack and the cattle remain in the same vicinity. “It’s important to respond and do everything we can do to reduce conflict,” he said. As long as there are wolves in the system the problem will persist. limited lethal control and nonlethal B. S. keeps perpetuating the problem that the rancher has to endure. This is nothing more than a delaying tactic by an out of control federal bureaucracy who’s real agenda is to remove livestock from public lands of which they have no legal authority to do. The rancher is the only one with something to lose , so the agencies can drag their feet, as long as it takes , until the rancher finally gives up. The compensation system is hopelessly inadequate. It doesn’t take into account the aggravation and worry, the weight loss, not being able to manage livestock or resources, the stress on defenseless livestock and ensuing illness because of stress. Removing one or two offending wolves may deter them temporarily, only to breed again and continue their nefarious agenda. The E.S.A. needs to be overhauled or repealed and the experimental designation needs to be called an experiment that has gone woefully awry.